Musculoskeletal pain commonly occurs without any demonstrable underlying pathology. This has led to consideration of the influence of psychosocial risk factors (such as low mood and tendency to somatise) and of a person’s health beliefs and expectations. Our more recent community studies of arm and knee pain have highlighted the importance of low mood, somatising tendency and poor self-rated health in the incidence and persistence of musculoskeletal pain. We have explored the hypothesis that risk factors for MSDs might differ according to whether or not they arise from demonstrable mechanical injury. Findings from our recent study of sensory symptoms in the hand have supported this hypothesis. We also investigated the impact of culturally determined health beliefs and expectations on MSDs by initiating and coordinating the multi-national Cultural and Psychosocial Influences on Disability (CUPID) Study. It provides a unique insight into how patterns of symptom-reporting and associated illness behaviour vary among workers from different countries with different cultures. It suggests that disabling symptoms may be caused or amplified by psychosocial and cultural, as well as physical factors. We carried out a case-control study of 908 patients aged 20-64 years referred for neurophysiological investigation of suspected carpal tunnel syndrome (CTS). Cases were distinguished into those with and without objective evidence of impaired sensory nerve conduction (SNC) in the median nerve. The first step was to establish a threshold for abnormality of SNC. This was not straightforward since there is no reliable gold standard for the diagnosis of CTS. However, using data from 1806 hands of cases, we were able to establish the pattern of symptoms and signs that was associated with the greatest mean impairment of SNC. We then identified a cut-point in the continuous distribution of SNC measurements which best discriminated this combination of symptoms and signs from normal hands. Using this cut-point, we found clear differences in associations with risk factors between individuals with and without abnormal SNC. Impaired SNC was associated with obesity, use of vibratory tools, and repetitive occupational movements of the wrist or fingers whilst similar symptoms with normal SNC showed no association with obesity and a much weaker association with vibratory tools, but a relation to somatising tendency. At 18 month follow-up, surgical decompression of the median nerve was associated with resolution of symptoms in patients with abnormal SNC but not in those with normal SNC. These findings support the validity of our proposed definition of abnormal SNC and our hypothesis that risk factors are different for musculoskeletal symptoms that occur in the absence of demonstrable pathology. Data on musculoskeletal symptoms, disability and potential risk factors were collected by a standardised questionnaire from 12,426 workers in 47 occupational groups in 18 countries. The occupational groups comprised nurses, office workers using computer keyboards and other workers” (most of whom carried out repetitive manual tasks with their arms or hands). A baseline survey was followed by further questioning after 12 months, but to date, the international analysis has been limited to the former. Striking differences in the prevalence of symptoms were observed. Among office workers using computers, the one-month prevalence of wrist/hand pain that was disabling for everyday activities varied more than 14-fold between countries, while disabling back pain in nurses varied fourfold. 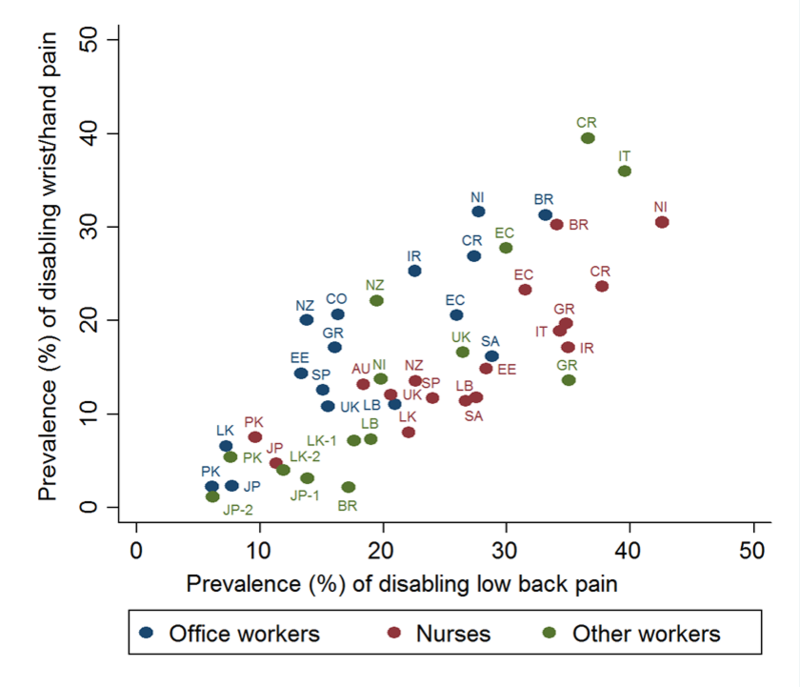 This variation was much great than the difference between office workers and nurses within countries, was not explained by differences in exposure to established individual risk factors (although such risk factors showed expected associations with pain outcomes), and was only partly explained by group-level characteristics such as social security provisions, security of employment and pay, and prevalent awareness of MSDs. We also found marked variation also in prolonged sickness absence (>5days) for MSDs. Risk factors for such absence included older age, lower educational level, tendency to somatise, physical loading at work and prolonged absence for non-musculoskeletal illness, but these explained only a small part of the variation between occupational groups. This suggests that cultural determinants can have a much greater impact on sickness absence for MSDs than the physical demands of work. These findings helped to inform an independent review of sickness absence for the UK Government (2011). A third analysis from the CUPID study looked at multi-site pain. Musculoskeletal pain often occurs simultaneously at more than one anatomical site, and there has been debate as to whether multi-site is simply one end of a spectrum of severity, or should be regarded as a distinct clinical entity. Using data on pain at each of 10 anatomical sites, we showed that multi-site involvement (especially of six or more sites) occurred much more frequently than would be expected if pain at each site were independent. Moreover, it showed much stronger associations with risk factors (especially psychosocial risk factors) than pain limited to 1-3 sites. However, there was no threshold number of affected sites above which associations were qualitatively different. This will be followed up by further analyses looking at associations with pain that is restricted to just one site. In addition to investigations using the full CUPID dataset, we have also contributed to cross-sectional and longitudinal analyses based on national components of the study in Greece, Japan, Spain, Brazil and Italy, Sri Lanka and Iran. These have shown, for example, that psychological risk factors may relate more to the disability associated with musculoskeletal pain than to the occurrence of pain per se.